Flax fibers look like small lengths of bamboo under a microscope. The gross internal composition of a flax fiber is shown in the figure (after Cardamone). The cellulose molecules in flax fibers are folded back and forth in a fairly regular arrangement, and they show the properties of crystallinity. The fibers are composed of closely packed "ultimate cells" of the fibrillar structure that are cemented together with holocellulose and lignin. You can see the ultimate cells under a microscope, and abraded fibers often show ultimate cells sticking away from the surface. These were the structures that were mistaken for "filamentous bacteria" by Garza-Valdes. When you rotate the stage of a petrographic microscope with crossed polarizers while looking at a flax fiber, straight lengths change from black to colored every 45?. The fiber is birefringent and has an ordered structure. Most of the cellulose of the fibers is in a crystalline structure. 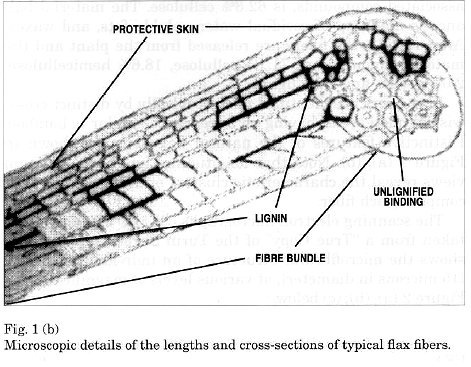 In structures like flax, it is called a "fibrillar" structure. McCrone ignored our agreements for work on the STURP sampling tapes: he stuck them all down to microscope slides. This made observations much harder; however, flax and cotton fibers can still be distinguished by their indexes of refraction. Crystallographic observations must be made on the specific fibers that reach extinction at the same angle as the tape (while everything is black). The index of refraction of a normal linen fiber parallel to its length is nearly identical to that of the adhesive on the sampling tapes (it nearly disappears). That index is very close to 1.515. The index across the fiber is appreciably lower than the adhesive. The indexes of refraction and crystallinity of image fibers are identical to unaffected fibers. Bent, crushed, or otherwise damaged fibers show strain dichroism and will give an erroneous index. Most flax fibers show intense birefringence colors when they are viewed at a 45º angle from the plane of polarization of the microscope. Cotton has a low birefringence, usually appearing white (first-order white), and it is a thin, wide tape that shows periodic reversals (twists).